In 1975 I was looking for a career that would fascinate me for the rest of my life. In a way, weaving chose me! Silly me - I miscounted how many warps there are (or are going to be - I still haven't finished winding them all) and there are only 18, not 20. I'm actually happy about that. I'd decided that, in the spirit of recovery, I would weave all of these warps before I tried something a little more, well, physical. So having two less than expected was actually quite a nice discovery. I saw the physio today. She spent nearly an hour talking with me about the surgery and how healing has been going, then did an extensive evaluation of where I am right at this minute. She was pretty amazed at my range of motion, to which I think the massage treatments should be given credit for how well I can move my arms. She will draw up a personalized exercise program, then let me have at it for a couple of weeks after which I'll go back for a re-evaluation. Heard from the cardiologist's office today and she is sending me for more tests and unless anything untoward pops up, I probably won't see her for three months. So I'm really glad I went ahead with starting physio (after getting approval from my family dr). As mentioned previously, this yarn is being woven very open. 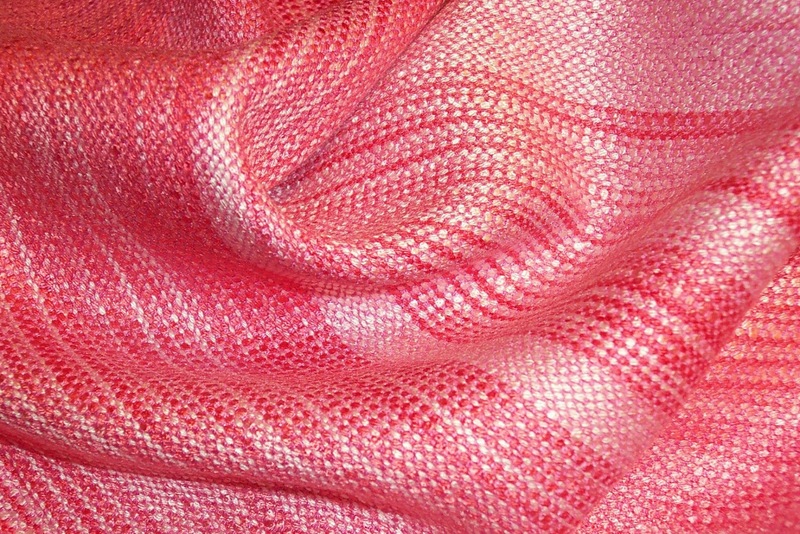 It is a highly textured silk, a bit stiff and a little coarse feeling, due to the high degree of twist and the torquing that happens as a result of that high twist. In order to encourage the cloth to drape, the epi/ppi is about 10. I say about because mostly I'm weaving the weft in by feel more than anything else. This is truly a situation where "If you can't be perfect, be consistent" is a big factor. And the way I can get the closest to being consistent with this cloth is to feel how the beater pushes the weft picks into place. In previous posts I think I've talked about beating a very open cloth. At any rate, it is a subtle thing and you really need to pay attention when you do it. When weaving a very open cloth, the beater is moved towards the fell slowly rather than the usual crisp tap. The whole point being you don't want the weft picks to be side by side but with a space between them. So as the beater comes forward, slowly, you should feel resistance as it gets closer to the fell. This resistance usually happens about 1/4" away from the fell line. When this resistance is felt, the beater is then squeezed, very gently - and with the same degree of force each time - closer to the last pick. How close will depend on how much space you want between each pick. With such a textured yarn, the warp and weft threads are not going to be perfectly straight. I think that is quite clear in the photo above. There will be some deflection of the threads, again, partly because of the high twist of the yarn and it's tendency to torque, partly due to the texture. Bottom line, consistency. That is what is going to work to make such an open cloth from this yarn. 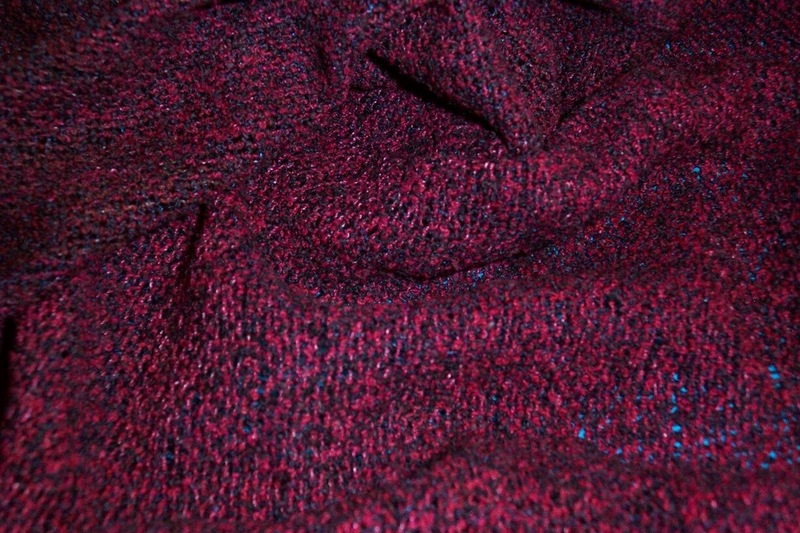 Two shots of the same shawl. The top photo was taken with the ordinary flash, the bottom using the 'red-eye' feature of the flash. The bottom photo is much closer to real life than the top photo. I discovered by accident that using the red-eye feature gets me better representation of reds, especially. This shawl has been wet finished and in the bottom photo you can see how open and airy it is as the blue of the table top shows through the cloth. 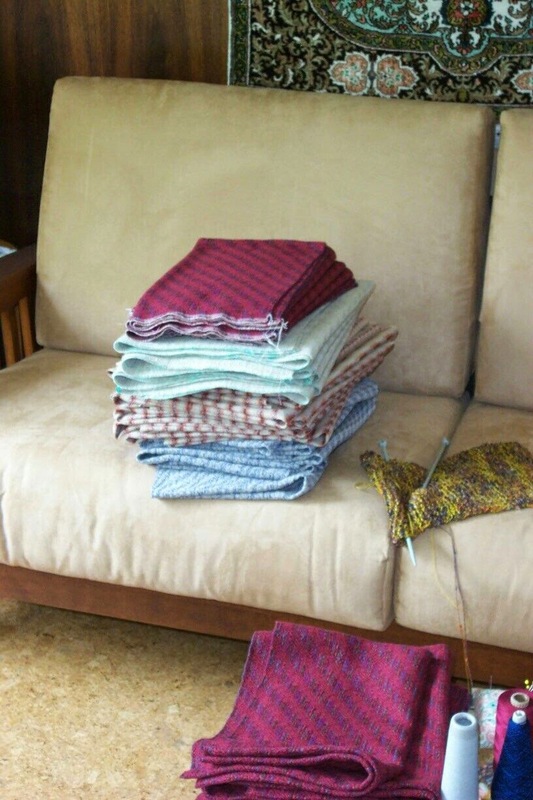 Some people get bored very quickly with weaving and won't even weave four place mats with the same threading/tie-up/treadling. OTOH, I find weaving the same thing over and over soothing. 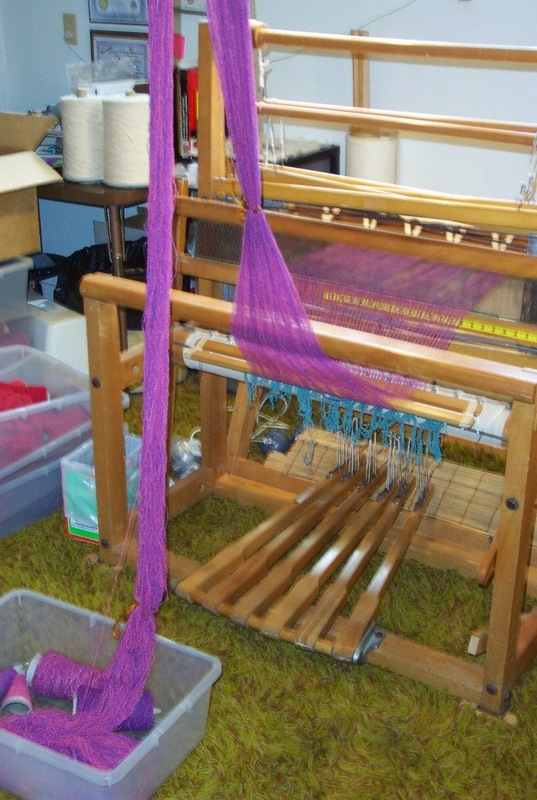 I don't mind any part of weaving, including weaving repeats of a textile to develop a line of scarves, place mats, shawls. The colours may, or may not, vary. Weaving the same quality of textile then becomes a working meditation or, as in the case of these shawls, very much therapy as I try to reclaim my physical fitness after surgery. I'm still far from recovered, but healed enough that the work of rebuilding my muscles can begin. On Tuesday I will start physio, but in the meantime I am gently working my way through these textured silk shawls. My colour selection is limited to what I have left in inventory, but that's ok. I have four shows coming up in Oct/Nov and if shawls continue to sell the way they did last year, having depth of stock will be A Good Thing. And I am determined to use up as much of my stash as possible. I have promised Doug I will not win the estate sale contest. To that end we are doing two fibre shows this spring to try and sell off more of the re-sale yarns I have. Whatever is left after those sales will have to be woven up by me, preferably as quickly as possible. Since I am officially turning into a 'senior citizen' this summer, coupled with the long list of health issues that have suddenly (it seems like) reared their heads, I have some serious thinking to do about the future and how much I am willing - or able - to do. But I really don't want to think about that too much until I find out what my new normal is going to be. In the meantime, there will be a lot of repetition as I use up my rather extensive stash. And that's ok by me. One of the things we forgot to tape for the DVD The Efficient Weaver was how I rough sley the reed as a raddle and how it gets put into the loom. Since someone also asked about transferring the cross, here is a photo essay showing those steps. Laying the reed across a couple of small boxes, I sley the warp into the reed. In this instance I want 10 epi, but have wound two ends at a time. Since you never want to separate the loops at the end of the warp chain, a complete loops goes into one dent, then three are left empty to achieve 10 epi density. Once done, the reed is flipped over top of the lease sticks. 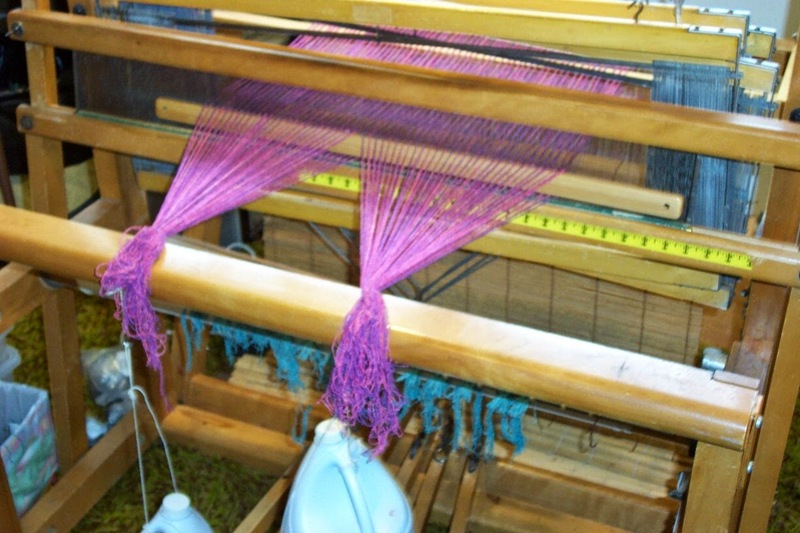 The loop of the warp is now picked up and held by a third lease stick. 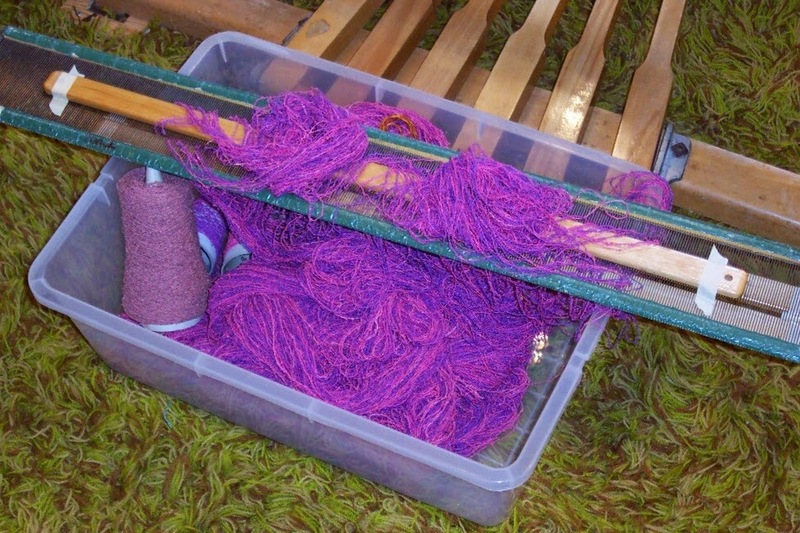 The bundle of reed and lease sticks is laid across the bin (or box) and carried to the loom. In this instance I also threw in the cones I expect to use for weft, just to keep everything together. 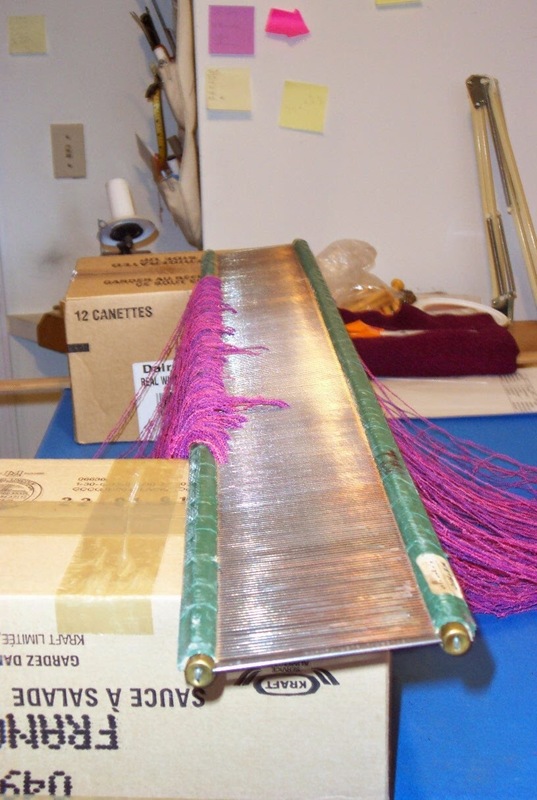 The reed is inserted into the beater (see picture below) and the third lease stick holding the loops is carried to the back of the loom. The apron rod then picks up the loops from the stick. In this picture you can see the loops are messy. 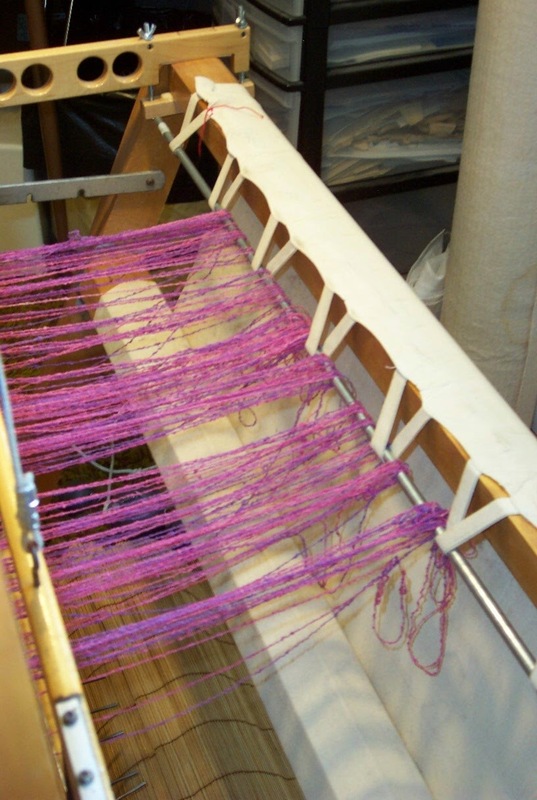 These uneven loops straighten out quickly by going to the front of the loom and gently pulling on the warp chain at the choke tie, which hopefully has done it's job and not allowed any unevenness to transfer beyond the choke to to the rest of the warp. The loops have been straightened out. Since this yarn is textured, it needs a little extra grooming. I do this by grasping the choke tie, applying gentle tension on the chain and then sliding the lease stick back and forth to encourage the threads to even out. 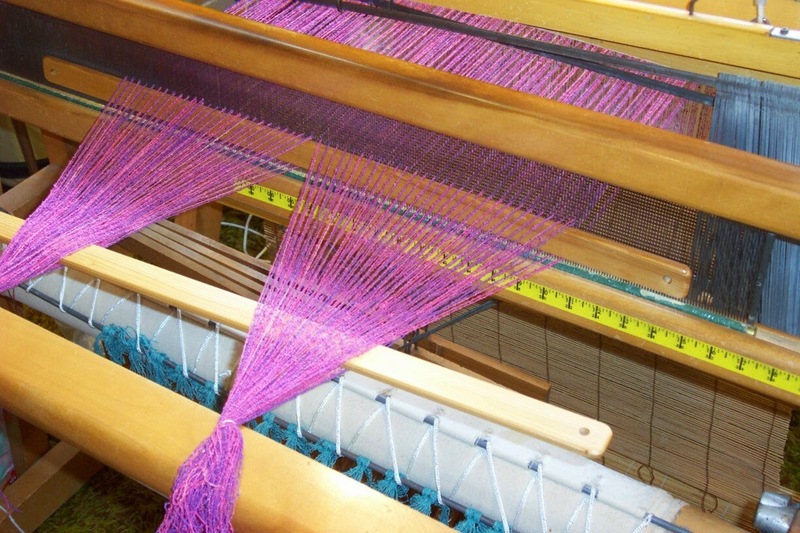 The weight is applied to the warp chain to provide tension for beaming and the lease sticks are raised as close to the warping valet as possible without snagging any of the threads. The goal here is to have equal tension on the threads. Snags will increase tension on those threads caught up. in the snag. 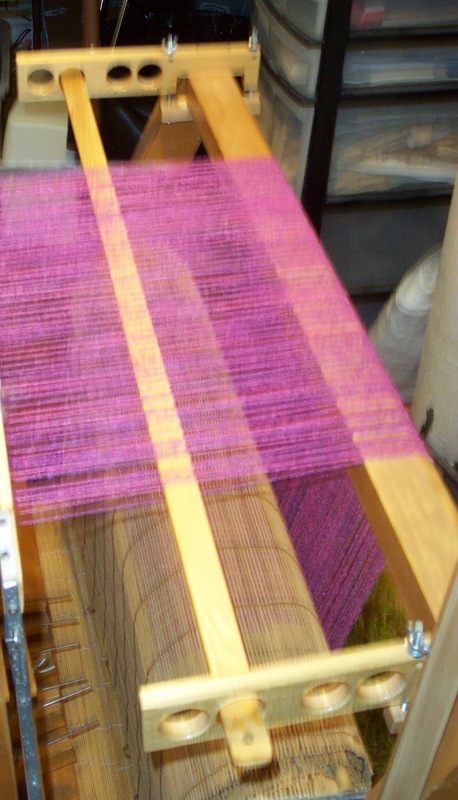 The warp is beamed by rolling the warp forward. The lease sticks will descend to the breast beam at which point the weight is removed and moved further down the chain and lease sticks raised as high as they can easily go. Repeat, inserting warp packing, until done. Here I've divided the warp chain into two sections. If I didn't the warp is wide enough that the outside ends will have more tension than the inside ends for the last few feet. Removing the masking tape (or whatever is used to secure the lease sticks) the stick closest to the reed is tipped up on it's edge to form a shed. slide it to the back where it is inserted into the Angel Wings (sold by Purrington Looms). I've found the front set of holes is about perfect for me to thread from. gets inserted into the front hole of the Angel Wings. The clamps hold the lease sticks so that they can't pop out of the Angel Wings and the warp is secure. I cut the loops at the beater and the warp is now ready to be threaded. 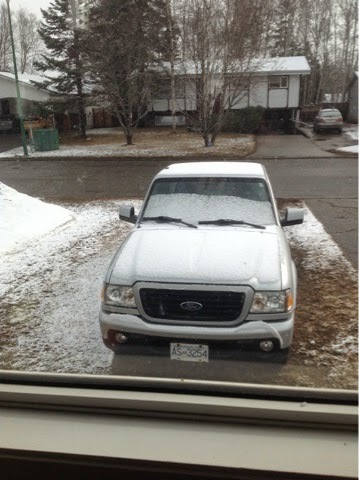 Hopefully the snow won't last long. The beginning of a new 'week', another milestone. I have been so very good about not doing anything I should not during the 6 week healing phase of this journey. Now I'm well past that and getting anxious to reclaim my life. 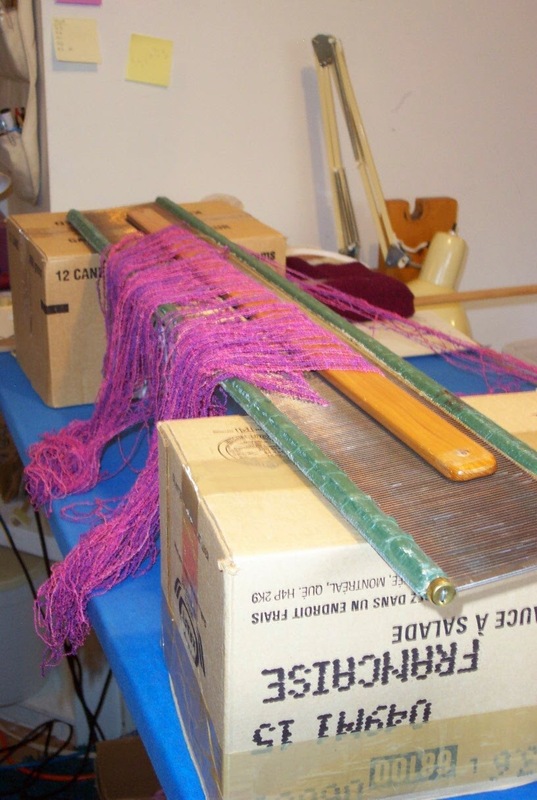 I have boxes and boxes filled with warps waiting to be woven and two looms with warps poised to be turned into cloth. This morning I decided it was time to try weaving. 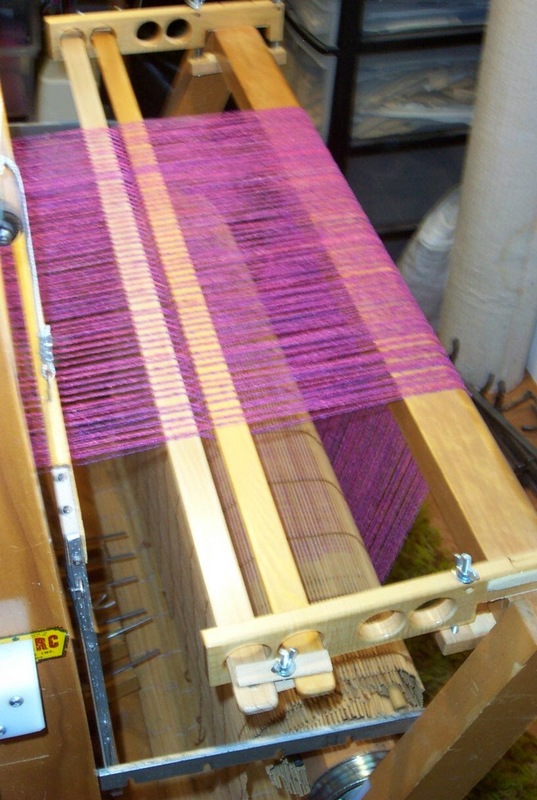 I purposefully left the small loom set up with a warp that required practically nothing in terms of beat. 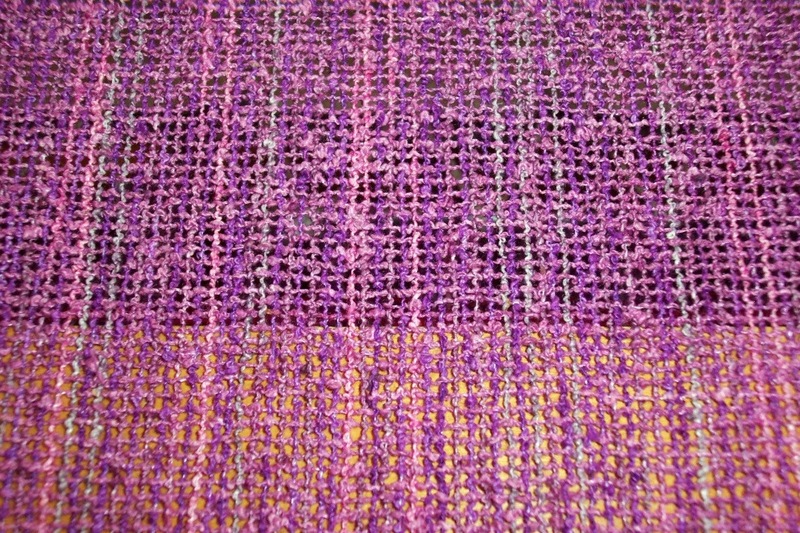 It is a textured silk (I was told it was referred to as 'gimp' not 'boucle' because there are no loops as such, but made from one very highly twisted main singles plus binders which torques and creates a textured yarn) and set very openly at 10 epi. 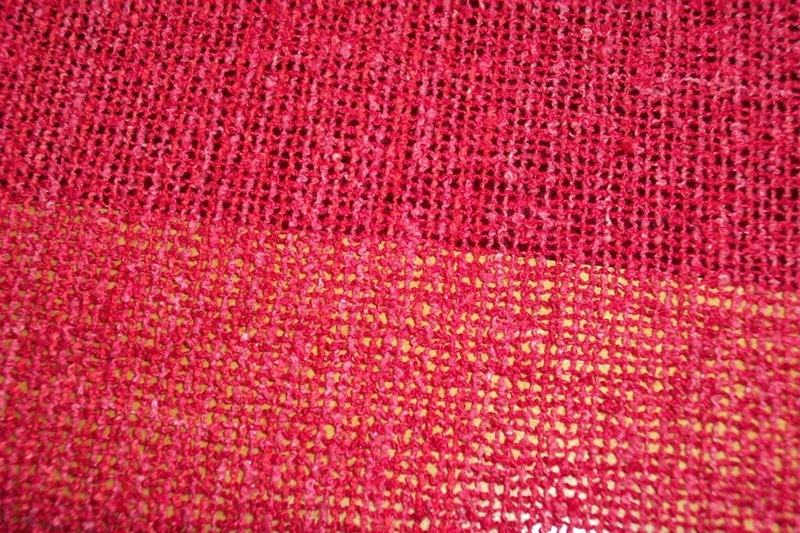 The goal is to weave it at 10 ppi, which means the weft picks are merely squeezed gently into place. My left hand is still numb which is making shuttle handling a bit of a challenge but I was able to weave about 15" before I decided that was probably enough to be starting with. The live weight tension system is also helping because very little effort is required to roll the fell forward. Ultimately I think if I weave for a few minutes then go do something else for a while then weave for a few minutes, I will gradually build up strength without stressing my body too much. 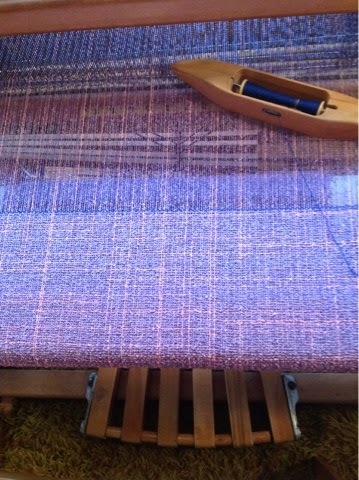 I might ask a friend to come help dress the loom again once this warp is off, though. The vendor hall is open from noon until 5 pm Friday, then 8:30 to 5:30 on Saturday. We will be there will weaving yarns and some woven textiles. The past week I've been able to sleep on my side - my preferred position - and as a result I've been sleeping a lot better. Gradually I've been feeling as though I have a little brain power. Today I set myself the goal of starting to write some long delayed blog posts for Craftsy. Not sure they will accept them because I didn't get permission for the topic(s) beforehand, they are just things I think need to be said. So the first one is on weft packages. New weavers don't always get shown how to wind a paper quill. Quills can be handy if you are weaving with lots of different colours and you don't have enough plastic bobbins. Or maybe you just don't like plastic bobbins. They do make a bit of a chattering sound as the yarn reels off of them and some people just don't like the noise. I think I've got a clip on You Tube showing how I wind them, but I don't think Craftsy is going to allow a link to my You Tube channel so I won't include that in the post. Not sure if Janet Dawson covers this in her class on Craftsy, but I'm sure she shows how to wind a bobbin. Unfortunately my left hand tires very quickly and after writing up the post for Craftsy and this, I think I need to rest my hand for a while. Now that week 8 is half over, and I still haven't heard from the cardiologist's office, I'm getting antsy. One way of coping with it was to wind a bunch of shawl warps once Doug had enough skeins onto cones. So for the past few days I have wound 7 warps and pulled potential wefts for them. The top one doesn't have weft cones yet because now Doug needs to wind off more skeins. Since I emptied quite a few cones, he now has enough to finish the job. Not sure what I will do for the next few days but I'm definitely feeling like I need to increase my activity levels in order to continue to recover. My goal is to walk at least once a day, preferably twice, although that doesn't always work out due to weather or appointments. But I managed another milestone yesterday by getting my step count almost to 5000. Mind you I think some of those steps were because I knitted for a while and Fitbit seems to think knitting is akin to walking. :) Still, it has been nice to see the numbers trending upwards. Prior to this latest round of health issues my step count goal was 10,000, reduced to 7500 after the angioplasty and back blowing out last summer. My goal is to get back to 10,000 - eventually. But whatever number I get to, I want it to be more than 5000. Everyone - and I mean everyone - keeps telling me walking is the best thing I can do. I disagree. I think weaving is the best thing I can do! But I'm not quite there yet, so walking will have to do until I can. As a student, I really hated math. I wasn't good at it, didn't understand it most of the time, got confused by the formulas. Imagine my dismay when I began weaving and discovered that I was going to need to use formulas and math! There was a difference with this math, however. It wasn't theoretical, it had a purpose. And if I plugged the numbers into the formula, I got a meaningful answer. There are all sorts of places to find out what values to assign to the formula. If it is a simple "how much yarn do I need?" the formula is in most books and on-line spreadsheets. Marg Coe's Mother of All Spreadsheets can be found at her website and I think on Weavolution. It may be elsewhere, too, as she has very generously allowed it to be published. 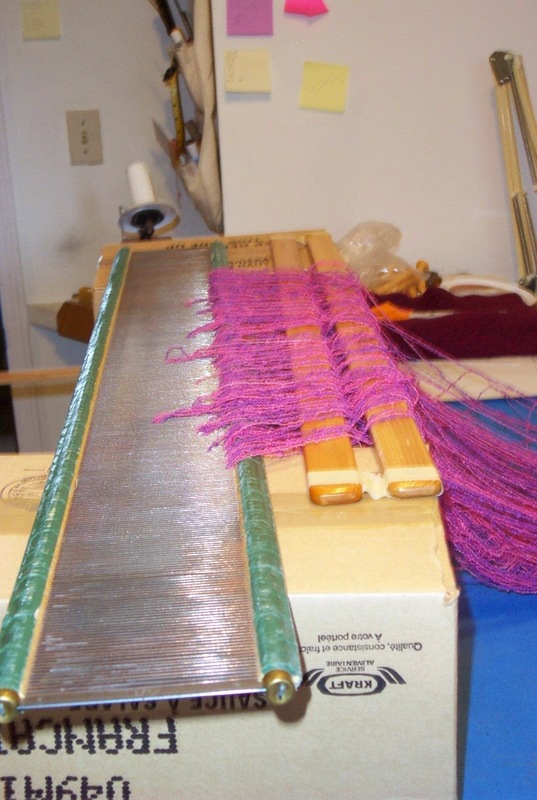 When I started weaving it was books or magazines or nothing. There was no internet - at least not for the general public. Interweave Press published a little booklet sometime in the 80's, I think, with tables of use for weavers. It has things like recommendations for density for various yarns. I don't agree with all of them, but that's just me. Weavers will have to learn for themselves if what is being recommended is actually useful for the quality of cloth they want to make. Sample, sample, sample! I still don't much like math - I think I have mild numerical dyslexia because I so often flip numbers when I'm punching them into the calculator. I can run the same formula three times and quite often get three different answers. :( But using a calculator is still better than trying to do it in my head! So when new weavers ask how much yarn is needed for a project? I will help them do the math. But doing the math is what has to happen. Math phobe or not. Oh that pesky English language. You know, the language that evolved from so many other languages? So many that we have multiple words that mean the same thing, but we also have words that have multiple meanings? Yes, that English language. It gets very confusing! Craftspeople who practice one art and take up another may think they know what the words they are hearing mean, but quite often they don't. And because they think they know what they are hearing, they simply don't understand the information that is being conveyed. So, what are some examples? 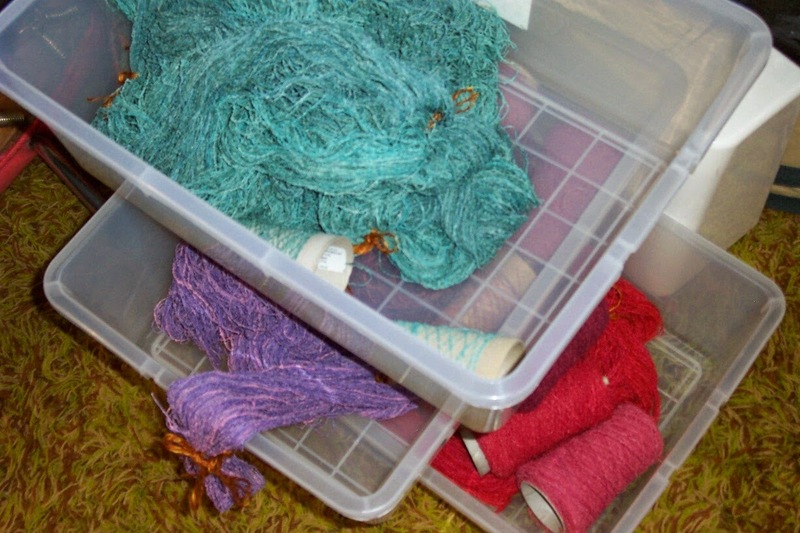 Knitters taking up weaving often have a large stash of worsted (weight) yarn they want to use up. Unfortunately the word 'worsted' does not mean the same thing to spinners and weavers as it does to knitters. For knitters 'worsted' means a weight or thickness of yarn. 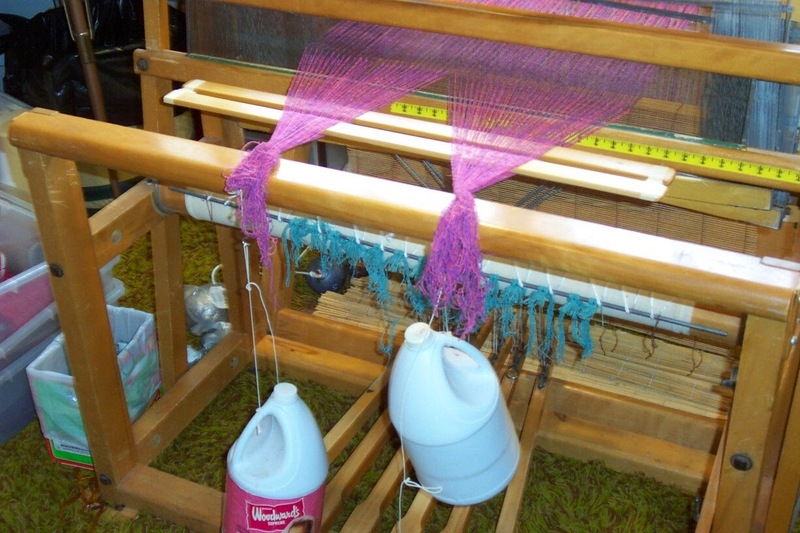 For spinners and weavers, it is a particular quality of yarn that may come in a large variety of thicknesses. The photo above shows one of these points of confusion. Both are cotton at about the same grist. Are they the same? Quite obviously they are not. But these yarns are treated by many weavers as though they are identical. What they are is approximately the same thickness (3360 ypp) but they are not the same in terms of strength, texture or how they will behave as warp/weft. And yet they are consistently referred to, both of them, as 8/2 cotton. So what other words elicit confusion? Fulling/felting. Harness/shaft. These words are used interchangeably. I no longer know if they are the same, just so long as everyone knows what I'm referring to when I say 'shaft'. 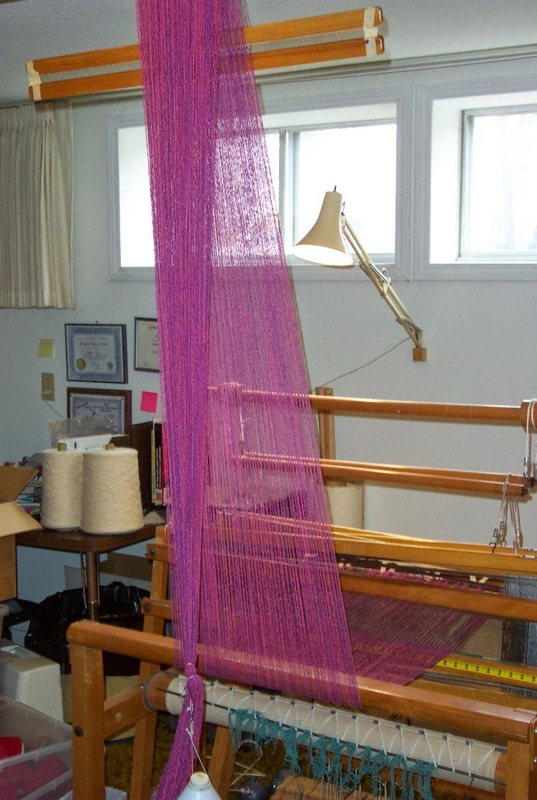 Weaving is a craft that has developed over thousands of years in pretty much every culture of the world. Is it any wonder we get confused when we start to try and communicate outside of our craft and our culture? Language is meant to clarify, but sometimes it just confuses. Weaving is a physical activity and after 8 weeks of being physically inactive, my muscles are very weak. Or at least my upper body is. Since I've been able to walk outside I have been at least working on my legs. Since I still have not seen the cardiologist yet I don't feel like I should be weaving but I thought I could at least wind some warps. Which is when I really realized how much muscle tone I'd lost. 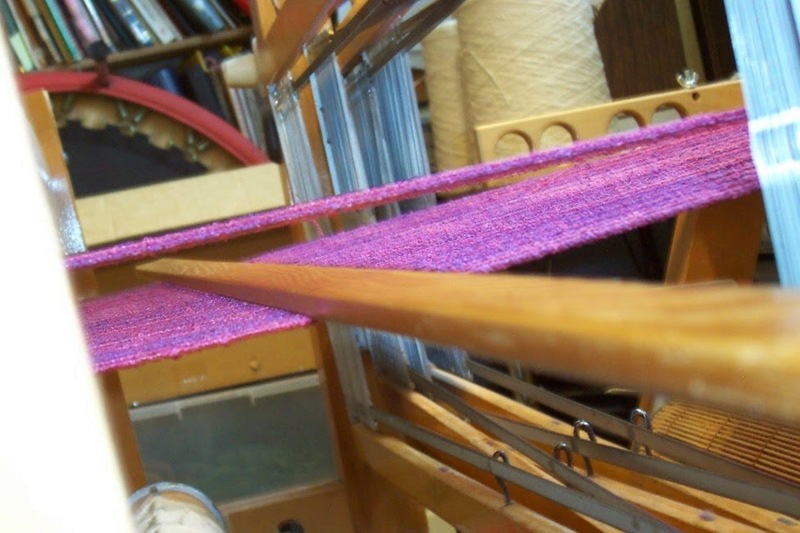 Yesterday I managed half of a 9 meter long shawl warp (about 22" wide total, so about 11 inches). Today I finished that off. Doug has wound about half of the yarn onto cones but is running out of cones so one reason for winding warps is an attempt to free up more cones for him to use. The down side? 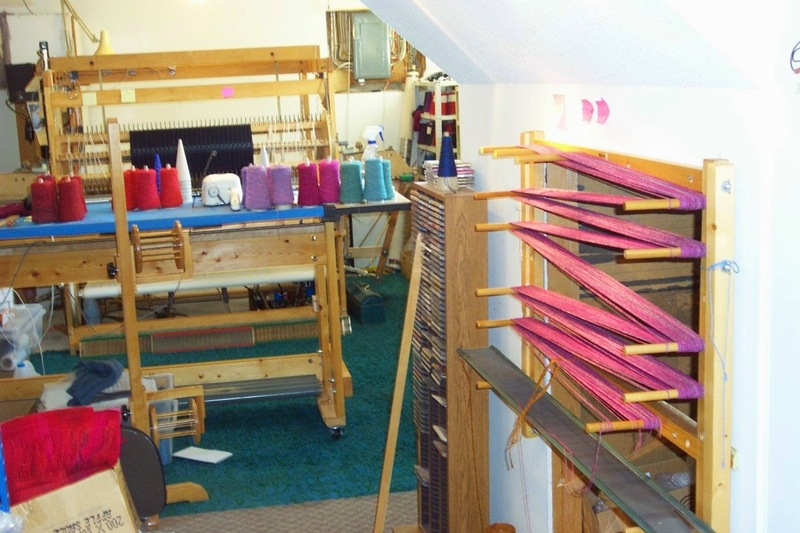 We both need pretty much the same space, he for winding cones, me for winding warps. So we are having to alternate. Right now I've got the table filled with potential warps so he can't really work there. So I'm taking a long break and then I'll start winding another warp. I figure if I do another half warp this afternoon, that is a reasonable thing in terms of building my muscles up again. Some days it is hard to see progress as it seems to be so slow. But looking back a week? Yes, definitely gains have been made. There are still areas which I wish would look more progressive, but you have to take your positive things as they come. So, I have started to drive again. Only short distances so far, but still. The hemming pile is pretty much done. Just one table runner left, then Doug will have a bunch of pressing to do. Last night I went to the guild room and was able to climb the long steep stairs without any real difficulty, something that had been getting more and more difficult before surgery. Guess all that walking has been helping regain strength? And it was a real boost to see actual benefit from the surgery, even though recovery is going to take a while, yet. Today I wound a warp for an upcoming lace workshop. Since it was only 120 ends, 3 yards long, I figured it would be a good test about whether or not I could start winding longer/wider warps. I took it slow, about half my usual warp winding speed and it seemed to be fine. Not knowing when my surgery would take place or how long it would take to recover, I cancelled all my commitments for teaching and vending for this year. Now that the surgery is done, I have been tentatively making bookings. The next date of note is the HWSDA conference, this year taking place in Red Deer, Alberta. Doug and I will drive out and set up a vendor booth with yarns and some textiles. I didn't apply to teach so the trip probably isn't really worthwhile financially - believe me you don't make a whole lot of money selling yarns. Normally I'm teaching, which helps to subsidize the booth. But with my health issues so much in the front of my mind, I decided that getting rid of some more of the yarn I bought to re-sell is probably A Good Thing. The conference happens in May and I'm really hoping for good weather for the drive. In June is Olds Fibre Week at which we will be vending, plus I'll be teaching Level Two again. Beyond that, I'm reluctant to apply to teach anywhere because I just don't know what state my health is going to be in. I have a feeling that my teaching is going to be confined to western Canada from now on. Or possibly the internet, if I can figure out what to do and find the energy to do it. With most bookings happening one to two years in advance, I just don't know if I will be able to do it and I really don't want to be in the position - again - of having to cancel events because of my health. 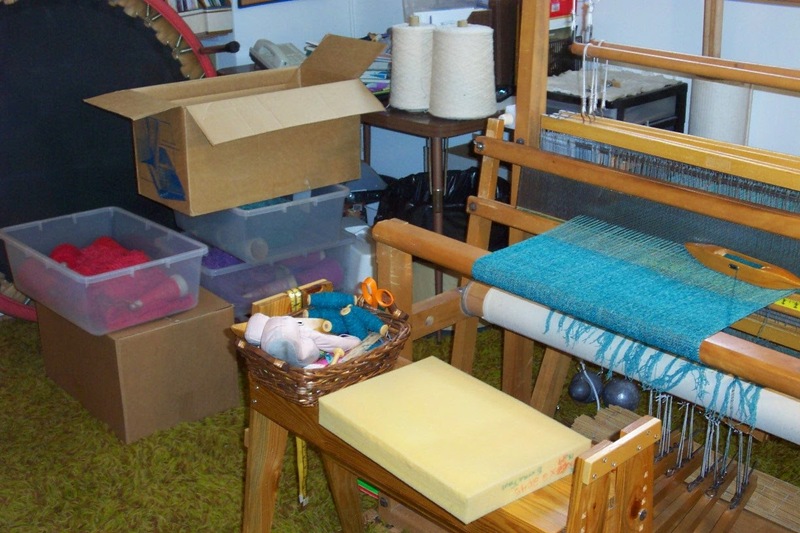 When I began weaving I really thought I'd be teaching well into my 70's. Well, I may be, but it might be digitally, not in person. Well, not quite - I have actually been hemming the last few evenings and the pile is diminishing nicely. Doug will soon have a pile of pressing to deal with. I won't go into details, but I have this past year seen a lot of 'aging' happening plus some adverse effects from the surgery have left me much more compromised than I had hoped. While it is still early days, plus some things have actually gotten better, I'm hoping to recover greater mobility than what I have at the minute. But some things won't ever get 'better' and I am going to have to wait to find out what my new limitations are going to be. That said, week 6 did see some significant improvement and today I took my first stand up shower which felt wonderful. Sitting to shower just doesn't seem...right. I have regained some mobility in my left hand and can now type reasonably well - except I keep hitting the Cap Lock key, which is annoying. But at least I can type for short periods. I'm hoping that as I keep working at the keyboard it will continue to improve. Knitting was a challenge but I think played a big role is recovering movement in my hand. Hemming was also..interesting...you take for granted the full use of your body and when you don't have that, all sorts of things become a lot more difficult. Walking proceeds. I did the full loop of the neighbourhood yesterday - twice. With sunshine today I'm looking forward to doing that again. But rain is predicted all next week, so I will have to dig out rain gear or go to the mall. I'm still waiting on a phone call from the cardiologist's office for the all clear to begin physio. I'm really hoping to get the call next week so I can begin the recovery part of the the journey now that the healing part is pretty much done. I don't want to try weaving until I have that all clear and some physio to judge how much effort I can do without straining. 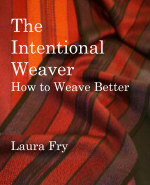 Weaving *is* physical, especially the way I do it. I have to watch my heart rate and not send it too high, especially to begin with. Of course I'm still on a fairly high dose of beta-blocker so I may not be able to do too much aerobic activity while I'm taking that. Time will tell and I need to watch to make sure I don't overdo. The biggest advance is that I'm beginning to think again. I have had several things on hold because I just didn't have the brain power or energy to deal with them. I think I'm nearly ready, especially now that I can more or less type again. Quite a few people who have been through this surgery have been in touch. It appears recovery can take up to three years for some people. I'm hoping that it won't take that long for me. Currently reading A Question of Identify by Susan Hill. Apparently I've read it previously but I can't remember the ending so I will continue reading until I do - or I finish it. We had been having such lovely weather people were starting to talk about Spring. 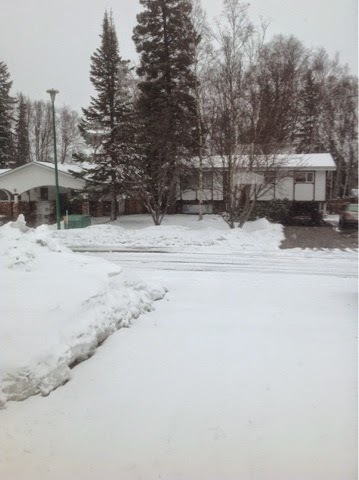 However, I have lived here all my life and am well aware that it can, and frequently does, snow well into March. Unfortunately, the road is now covered in several inches of snow which means my twice daily outside walks are on hold. Hopefully this spring snowfall won't last too long and I can resume walking outdoors, but in the meantime, it's back to laps around the fireplace. Or a trip to the mall where I can walk indoors. Will wait and see if the snow melts or hangs around. Nothing much has changed even though we have a new page on the calendar. Healing progresses, albeit more slowly than I would like. But tiny steps have been made. Right now I am waiting for an appointment with the cardiologist to get the all clear to begin physio. 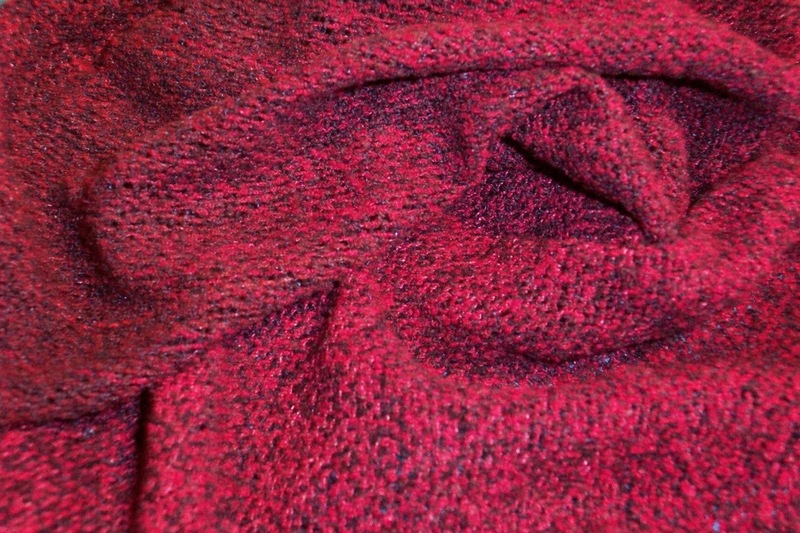 I started knitting a few days ago and have been eyeing the stack of hemming. I'm thinking I might be able to dig into that soon if I go slowly. For that I can only say thank you. When I began this journey 40 years ago in March 1975 I had no idea where the road would take me. It has been exciting and exhausting, perhaps in equal measure. I have met wonderful people, some of whom have taught me invaluable lessons, some of whom have become dear friends. I have been able to express my creativity, follow my heart, travel to far away places. But mostly I have been able to share my excitement about thread and cloth with like minded souls. None of us knows what the future may hold. All we can do is figure out what inspires us, then follow our dreams. And March on.